She's known for her bold style and equally unmissable vocals. 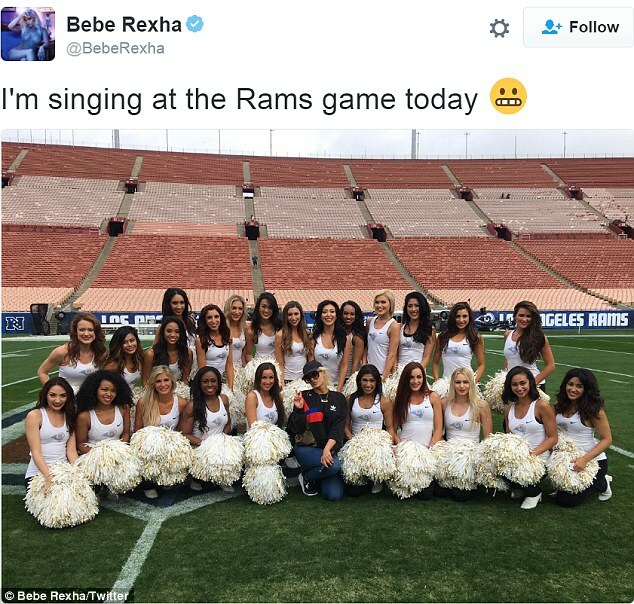 And Bebe Rexha put both at centre stage as she blasted out the National Anthem at the Los Angeles Rams game on Sunday. The 27-year-old singer showcased her curves in a sequin-covered skintight catsuit, during half-time at the L.A. Memorial Coliseum. The curvaceous beauty added a lace corset to cinch her waist, and even matched in her sneakers. She strutted her stuff in front of the crowd, and apparently put on more of a winning performance than The Rams, who lost 14-42 to the Atlanta Falcons. The platinum blonde stunner wore her tresses loose in barrel waves and a side-parting which framed her pretty features. Hourglass: The 27-year-old singer showcased her curves in a sequin-covered skintight catsuit, during half-time at the L.A. Memorial Coliseum. Displaying no shortage of make-up, the No Broken Heart's singer sported fake eyelashes and a cat-flick eye liner which further served to emphasise her almond eyes. Her brows were perfectly groomed and she added a peachy blush. A salmon lip hue filled out her bee-stung pout. She also shared a snap alongside the cheerleaders. Rexha had written several songs for other artists - including "Like a Champion" for Selena Gomez and Eminem and Rihanna's "The Monster before signing her own record deal.